Dogbyte Games' off-road racer is a beautiful, if short-lived affair. As an utterly obsessed Trials devotee, I'm always a sucker for any physics-based racer that turns up on the App Store. More often than not, what I end up with is a dollar's worth of disappointment that looks an awful lot like dodgy controls, poor engine responsiveness or just plain bad game design. 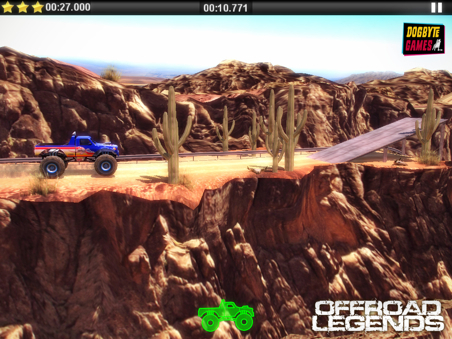 The first bit of good news is that of all the physics racers we've tried out, Offroad Legends has one of the finest engines we've experienced. Every truck, van, and lorry has a very different feel in its physics, so the articulated lorries behaving very differently as their back-end wobbles around beyond your control, and the all-terrain vehicles take the ramps with just a little too much aplomb. On these latter, you'll need to be very, very adapt at using the tilt or button controls to level out the vehicle after a leap into the unknown. Each vehicle's handling has a unique feel. And if the physics of the game are outstanding, the environments are nothing short of breath-taking. One of them is an obvious take on the Grand Canyon, and it looks gorgeous in the sun-drenched sky, while another shows off a snow-blushed Alpine valley. Elsewhere, gravel-pits are less pretty but no less fun to traverse. The majority of the levels in the game follow a similar theme: race across a series of obstacle courses set in these areas, leaping over ramps, riding over ravines, and doing your level best (no pun intended) to keep all four wheels on the ground. Take a nasty landing, usually as a result of failing to break before a sheer cliff edge, and you'll take damage according to the seriousness of the crash. If you reach maximum damage then you'll have to start all over again. 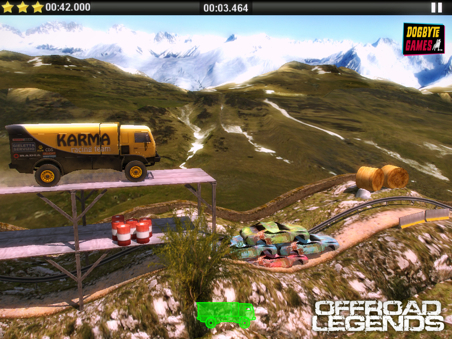 It'll be a while before you play a prettier game than Offroad Legends. Although these time-limited runs across the wilderness make up the majority of the game, there is some much needed variety to be found in alternative missions, such as attempting to race across a perilous landscape without spilling any of the cargo that you're carrying. It slips and slides around in the back of the van as you head over the bumps, hills and valleys, and so you'll need to make delicate use of your acceleration and braking to keep everything together. In other missions, you'll have to jump with precision in order to land on the bulls-eye of the highest scoring target on the ground. If you really want to up the silliness factor of the game, you can even head into the tuning section and add some outlandish set-ups for each vehicle. You can't take these (possibly overpowered) creations into the career mode, but you can have a lot of fun trying out every level as a test track. This adds some much needed longevity to what is otherwise a rather short campaign. You can re-tune the cars for added variety. Offroad Legends may be a little thin on content in the career mode, and you'll likely breeze through the game rather briskly, but it's still well worth the dollar that Dogbyte Games are charging for the privilege of playing. With the fantastic environments, varied physics and daft gameplay, this is the best physics racer we've enjoyed for some time. We'd just like a little more of it in a future update or sequel. What's Hot: A great physics engine in a very pretty game. 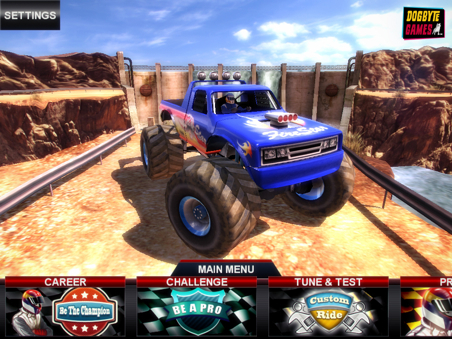 What's Not: Only the comparatively limited campaign holds Offroad Legends back from a higher score. There could be a little more variety in the music too.